.Note: Can be played on the Nintendo DS, Nintendo DS Lite, Nintendo DSi, Nintendo DS XL, & Nintendo 3DS Only. 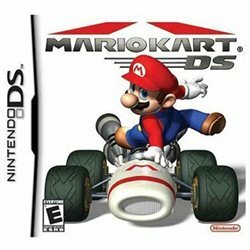 (Nintendo DS Games that require the GBA port for attachments will not work on the Nintendo DSi, Nintendo DS XL or Nintendo 3DS due to lack of GBA port. )Backed by a 45-day guarantee. ESRB Rating: E - Everyone Genre: Racing Features: Drive the competition off the roadways anytime, using Nintendo Wi-Fi Connection. Compete with up to four people wirelessly using Nintendo Wi-Fi Connection or up to eight people using one game card with local wireless connection. Race on 30 courses designed to replicate the best tracks from past games as well as all-new courses. Keep one eye on the map and the other on the action with dual-screen gameplay. It seems just like yesterday when the original Mario Kart made its debut on the SNES in 1992. The game was a hit back then, and it isn't difficult to understand why. A racing game that emphasizes on sabotaging your opponents with weapons like banana skins, flying shells and lightning bolts was almost unheard of then, and to do so with your favorite Nintendo characters was, quite simply, pure bliss. Not surprisingly, the game captured the hearts of..